Have you recently bought a new piece and want to be able to wear it on your shoulder like in the movies? Or maybe you want to conceal carry your gun. Never fear, we’re here to show you all you want to know in our shoulder holster buying guide. Before we get to the products, let’s tell you some things you’re going to need to go before you start shopping for the perfect accessory for your artillery. Hand: This refers to which hand the holster caters to. If you can wear it on either shoulder, you can pull it with either hand. Some have specific ways they sit and only work for one hand. Universal Fit: A universal fit holster will fit any gun of the type. If it’s a universal fit handgun holster, then you will only be able to put handguns in it, but they can be any handgun at all. Adjustable: Is the holster adjustable so it sits comfortably on your shoulders? You’re going to want one that you can adjust unless you have an extremely standard body build. This matters specifically for concealed carry, as well. Material: What is the holster made of? Usually, it’s leather or nylon, with very few exceptions. Sometimes the leather is another color besides natural, but the nylon is usually always black. Size: This is what the holster’s dimensions are. When you’re looking for a concealed carry holster, it’s important to know how big it is so you don’t get a size that doesn’t conceal well. Color: This is either going to be natural leather or black most of the time. In rare cases, it will be something different, but all the best products are black or natural leather. 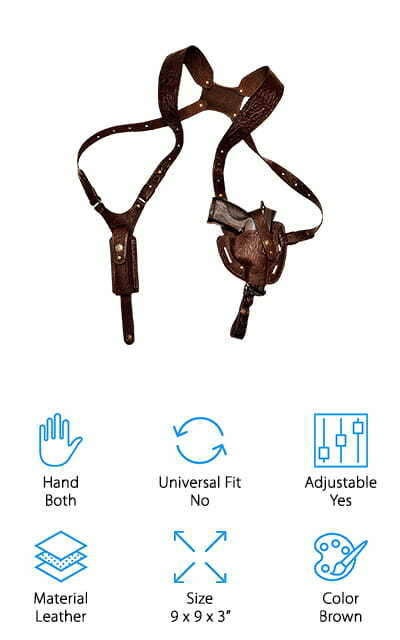 We can get our shoulder holster reviews now! We have looked at a selection of the best and brightest holsters and come up with a list of ten shoulder holster reviews that you are going to love. Check out our top pick and budget pick first, as they will show you what is on the market. But give the rest of the list a shot too, because you never know when you might find the perfect accessory! The Gould and Goodrich Shoulder Holster comes in black and is fully adjustable so that you stay comfortable while you’re carrying your gun. The back swivel helps the straps get flag against your back for perfect concealment. It comes in black and fits a small selection of Glocks from 17 to 39 models. It’s made in the USA, so you can be sure that you are supporting your country when you make the purchase! The leather that it is made of is the best in the world, as it is vegetable tanned, soft and supple. On the other side of the holster, there is a double ammunition carrier to allow you to keep all of your supplies on hand. This is an excellent high-quality shoulder holster, and definitely the best shoulder holster for sale that we found. Why settle for less when you can have the best holster with the best parts and most convenient construction? Our budget pick is the UTG Universal Holster. 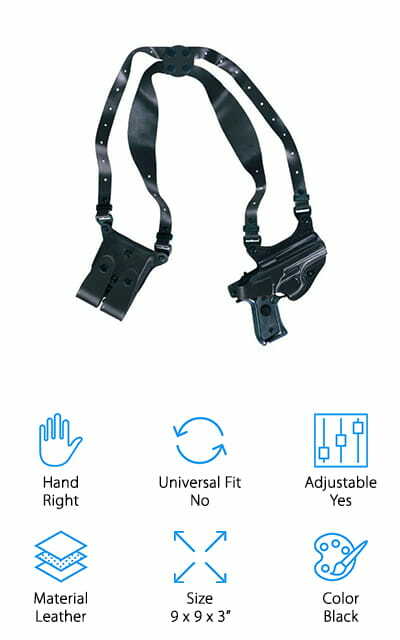 It’s got a universal shoulder holster design, which means that it will fit just about any popular model of pistol or revolver. The shoulders are padded, so it won’t make them sore and gives your piece extra support. The lining of the holster itself is a soft material that won’t scratch or damage the finish of your gun. Everything adjusts so it fits you comfortably and without any sort of undue stress. You can hook it into a web belt if you feel the need to, which allows for an even better fit. It works for both right and left hands, and there are two magazine pouches that will go on the other side. It’s easily the best cheap shoulder holster that we looked at. It’s a fraction of the cost of some of the other models and it’s just as nice! We love the padded shoulders and additional ammunition pockets. The Crosman Holster is another cheap shoulder holster that works really well. You can use it with both hands because it can be adjusted to either side and on the other side is a pouch where you can store two spare rounds of ammunition. We love that! This is a universal holster that will hold medium-sized handguns. It’s fully adjustable so you can find comfort no matter how tall you are, and the shoulders are padded so it’s got the proper amount of support and comfort. You can take this holder on and off by use of the quick-release retention straps that make it a breeze. The padded shoulders really help the neck strain problem that may other holsters face. We love the affordable price and comfortable design of his universal holster! It will fit most firearms of a certain size and two extra ammunition clips so you can carry your piece with you no matter what type it is. The Galco holster is made of steer hide leather and the straps aren’t dyed, leaving it a wonderful neutral leather color. 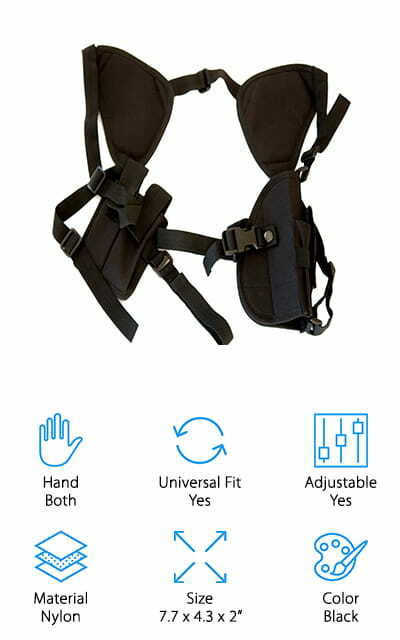 Each of the four straps pivots independently for comfort and adjustability. 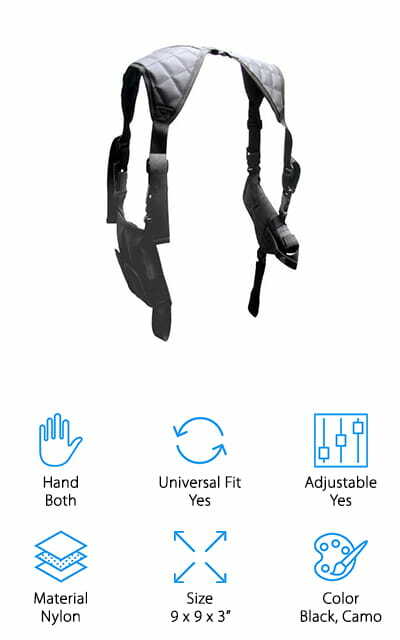 Though this is the right-handed version, there is an option to buy the corresponding left-handed version. 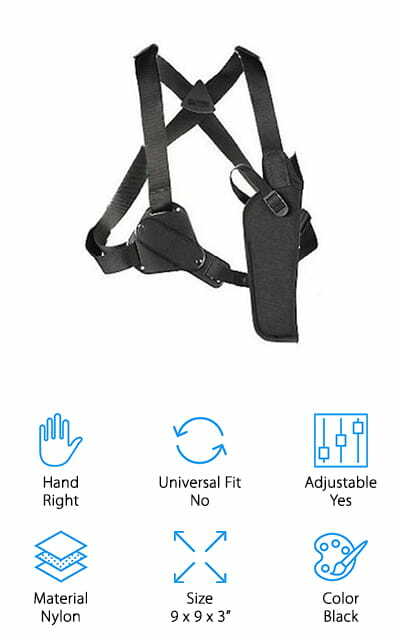 It’s a medium-width harness that is comfortable and extremely adjustable, with a lot of flexible pieces that will make it easier to move around as you need to. It fits Glocks ranging from 17 to 36 only, and it accepts tie-downs, cuff cases, and other attachments to be added. There is a one-clip extra bag on this holster for extra ammunition. It’s one of the best leather shoulder holsters on our list! The back plate is comfortable and unique to this company. This shoulder system is pretty amazing, all things considered – and it’s a great alternative to a more professional model. We are sure that you’ll love it! This shoulder holster from Federal fits the Springfield XDs and XDS pistols perfectly, so if you have that type of pistol this is the best concealed shoulder holster to get for it! It’s made in the USA of high-quality nylon and can be adjusted for use on either hand. There is also a six-way size adjustment feature and double shoulder pads that are comfortable and will stay flat under a jacket. On the other side as the pistol is a double magazine pouch so you can store your extra clips and never run out of ammo! There are belt tie-down straps and a snap release thumb break so that your gun is secure and you can easily get to it! It’s resistant to moisture as well as abrasions, and it keeps the surface of your gun looking just as great as the day you bought it! It’s so reinforced, we would trust it in just about any situation! Uncle Mike’s holster comes in both left and right-handed varieties so you can use it no matter which hand is your dominant one. 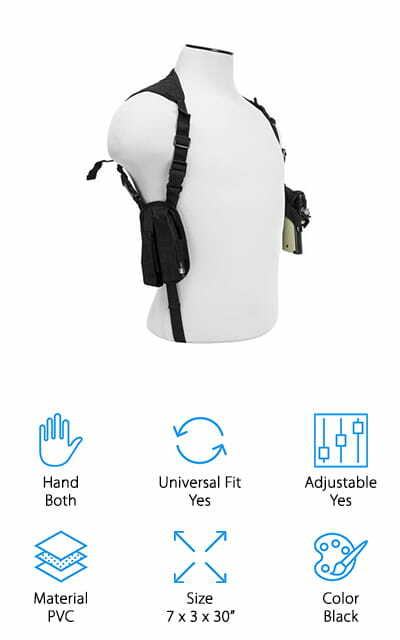 It’s fully adjustable with wide straps that are made of nylon for extra durability – the back piece centers itself to give you the best fit with as little effort as possible. You can tie it down to a belt so it doesn’t right up, and you have the ability to wear it inside or outside your jacket. The retention strap snaps and buckles in order to keep your gun right where you want it, instead of worrying about it falling out. It fits a variety of revolvers and pistols from 3 or 4-inch barrels to 6 to 7 1/2 inch barrels. It comes with a great men’s shoulder holster wallet where you can store your extra ammunition. It fits up to a 48-inch chest and you can always adjust it for size. Smith & Wesson is one of the most well-known names in firearms and firearm accessories, and this natural brown leather holster is no different at all. It’s made of one hundred percent genuine leather with adjustable shoulder and retaining straps, with included Velcro. IT fits a small variety of Smith & Wesson pistols and subcompact handguns, so if your piece comes from Smith & Wesson, this is the best leather shoulder holster than you can get for it! The magazine pouch is removable from the holster, and you can use it to strap onto your belt instead if that’s the way you prefer it! It also fits a few different Colts and Berettas as well, so while it doesn’t fit just any handgun, it does fit a variety of them. We love how this leather holster looks and feels, and how many special pistols it can hold! The workmanship is extremely high quality, and so are the materials! This Aker Leather Shoulder Holster is made in the USA from the finest cowhide and one of the very best products in the category. It’s made of vegetable tanned full grain leather (an incredibly high-quality leather). It is used by many different law enforcement and federal agencies in the United States and around the world. There are adjustable tension screws so that the shoulder straps can fit larger chest sizes, up to a maximum of 62 inches. This holster is molded to the frame rather than the barrel so it has a semi-universal fit. Plus, we love the contoured design! This makes it one of the best shoulder holsters for concealed carry. It can fit certain Glocks from sizes 17 to 27, so while it isn’t a universal fit holster, it does fit a wide variety of very popular handguns. We like how amazing this holster looks. The black leather is extremely high quality and reinforced so it won’t break or wear down easily. The Under Control Tactical Holster is pretty unique and amazing on our list. It is incredibly rugged and is definitely built to last. The black holster is waterproof and lightweight, with a perfectly compact size that won’t bulk up. You can wear this shoulder holster under shirts and it won’t look extra bulky! 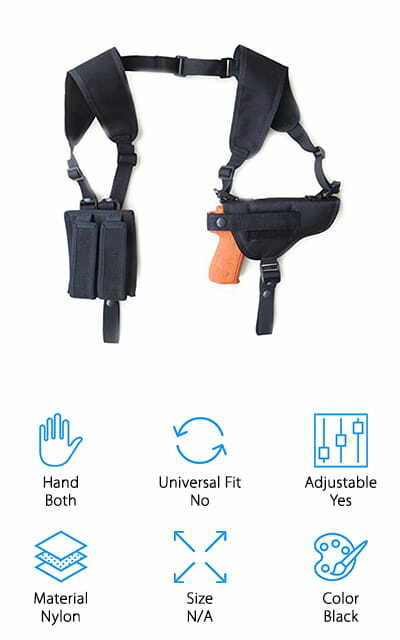 There are dual handgun pouches so that you can carry two handguns or pistols at the same time. 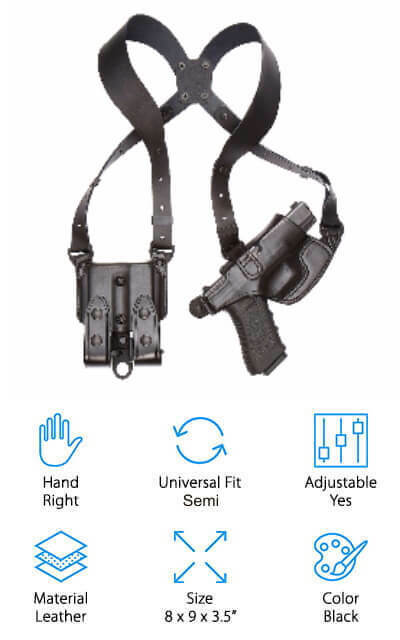 There are adjustable shoulder straps that hold the holster in position, as well as two flashlight pouches for illuminating handgun attachments. It is made by a small family business that offers a one hundred percent satisfaction guarantee, so you can return it if you aren’t entirely happy. It’s a universal fit for all types of handguns and revolvers. We’re sure that you’ll love it because we did! This holster really shines in our reviews for the professional quality of the materials and the manufacturing process! The NcStar VISM Holster is ambidextrous, so you can use it with both hands no matter which you shoot with. There’s an adjustable thumb break so it can accommodate different sized firearms and it won’t go anywhere. There are double snaps on the thumb break as well for the optimal security. 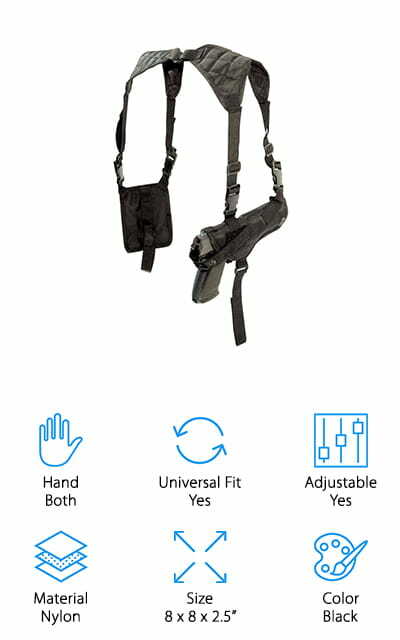 The double magazine holder that comes with the harness is spacious and you can easily fit two different clips inside. It’s made of PVC material that is tough and won’t easily break or scratch. 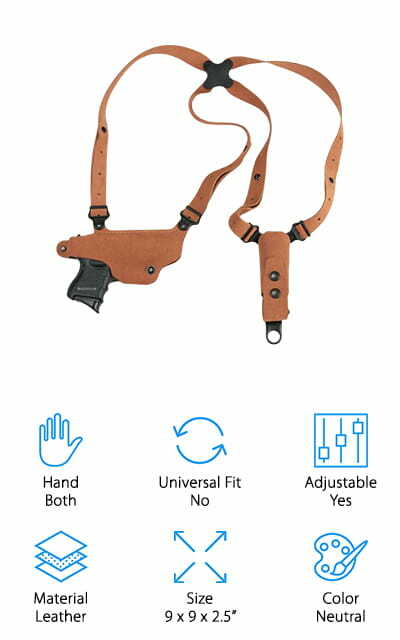 There are tie-down straps included for securing the holster to your belt or belt look. It’s adjustable to accommodate small to XXL sizes. This is a great horizontal shoulder holster. You can even take the double magazine holder off of the holster and attach it to your belt. We love how durable this holster is and how many features that it has! It’s a great accessory investment for your favorite sidearm.